Imagine a world of music right at your fingertips. The 280D makes this a reality. Simply launch your favorite music services app on your smart device and pair it to the 280D using Bluetooth technology. Then sit back and enjoy the music. A high performance fully asynchronous DSD256 / 32-bit DAC with versatility, including Bluetooth and MiND2 module! The MiND2 module provides convenience and a full graphic interface, allowing you to effortlessly access your digital music library with power and flexibility. Which ever way you use the 280D, it will become the centre of your musical pleasure. Fully asynchronous DAC supports DSD up to DSD256 (USB only) and PCM from 44.1kHz to 384kHz (32-bit on USB only). Eight digital inputs (AES/EBU x 1, S/PDIF x 2, TosLink x 2, USB x 1, Bluetooth® with Qualcomm® aptXTM audio support and Ethernet or WiFi for MiND) allowing for a connection to virtually any digital source. Streams TIDAL, Deezer, Qobuz and local libraries. DSD Streaming via USB input and over ethernet via MiND module. USB input with galvanic isolation which eleminates all ground current (i.e. no electrical connection) between the USB device (computer, music server, etc.) and the 280D, preserving the accuracy of the audio signal. 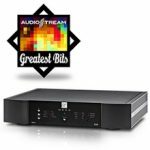 The entire analog stage is a fully balanced differential circuit for increased dynamic range and headroom,higher resolution, as well as improved signal-to-noise ratio. Advanced analog signal path using an exceptional DC servo circuit and proprietary 18dB/octave analog filter.